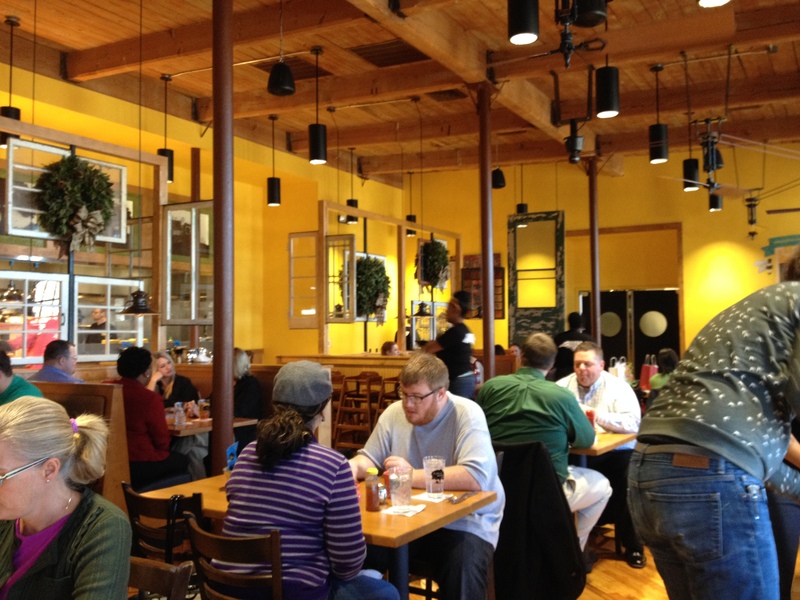 Our charter meeting was held at Tupelo Honey in Charlotte. We had to call for reservations, since I had too many folks coming to use the online reservation scheduler. No big deal, they were nice and efficient and had our reservation when we arrived. Actually, we arrived early and they seated us very quickly. Awesome! OK, so I have one knock on the place. It was smoking hot. I mean, I never cooled down. We were seated by the door and it kept opening with each new customer, totally screwing us out of cool air every time. Every time. If only they had a more “closed in” entryway, perhaps that could be avoided? All I know is I was hot. But, I did buy two drinks, so maybe there is a method to the madness? Our table ordered white wine, Sangria (red) and a mixed drink called a Honeysuckle and Lavender Flip. 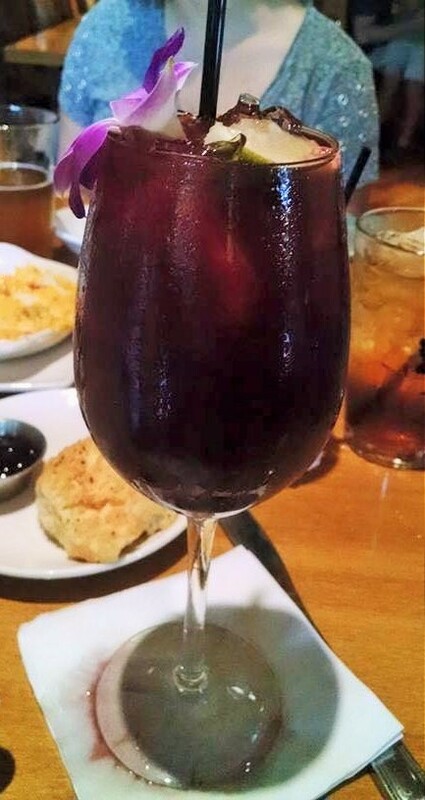 The Sangria was sweet and fruity and very refreshing. The Flip…well…that was light and sweetly resplendent. That’s right: resplendent. It was made with Cathead Honeysuckle Vodka and a house made lavender sweet and sour mixed with soda water and a squeeze of lemon. Served over cracked ice and a sprinkling of lavender buds on top, and you’ll hear an angel sing upon first sip. First up is a hearty appetizer: Fried Green Tomatoes. Any southern restaurant worth its salt must have this on the menu. But TH has their fried green maters on a bed of creamy goat cheese grits and that is nestled over the top of some brightly flavored red pepper coulis. What a perfect combination. The crispy, salty and sour fried green tomatoes was a perfect counter balance to the decadent grits. The coulis added just enough spice to tie it all together. A perfect dish that we had to order 2 plates of to share. The Jumbo Lump Crab Cake was another hit. It might have been the best crab cake I’ve ever tasted! Crispy on the outside and full of sweet large hunks of crab. Seasoned just perfectly! It came propped against a small salad a mixed dark greens dressed with a jalapeno aioli and tossed with sweetly sour baby tomatoes. That salad had a bite to it! Perfect addition to the simple goodness of the crab cake. 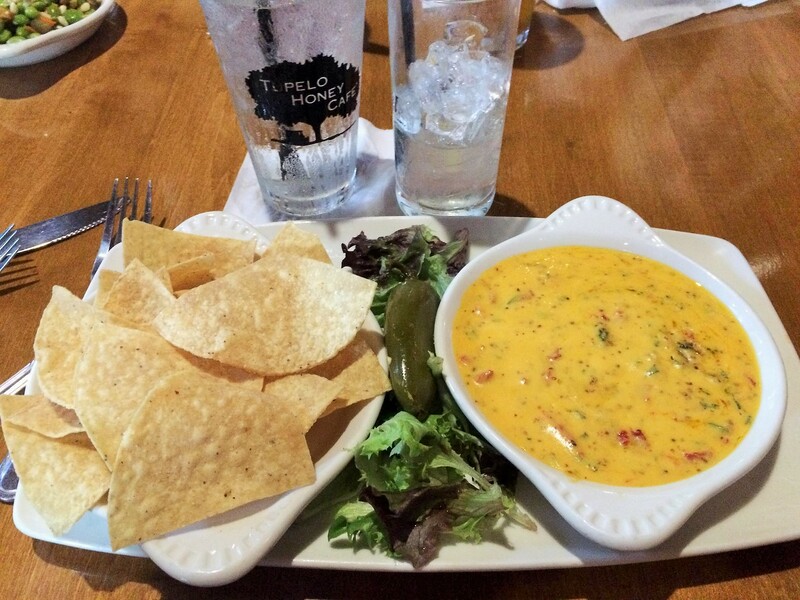 The table also thoroughly enjoyed Warm Pimento Cheese, like a Southern cheese dip, served with house-made tortilla chips. I looked around to see so many tables enjoying this simple, but unbeatably delicious, sharable appetizer. I can’t believe I’m saying this, but it didn’t even need salsa. It was that good. 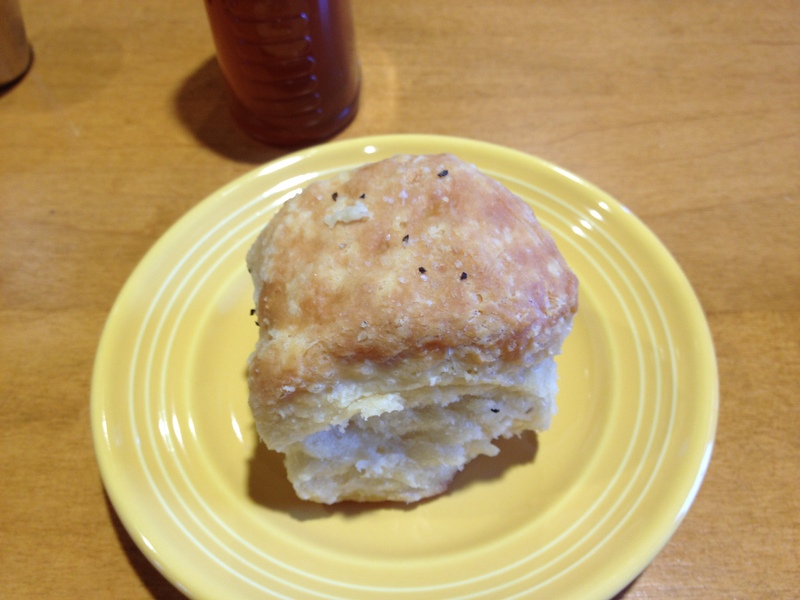 The humble Biscuit. Handmade, fluffy, salty and tender. Served with honey (of course) and blueberry preserves. A.mazing. 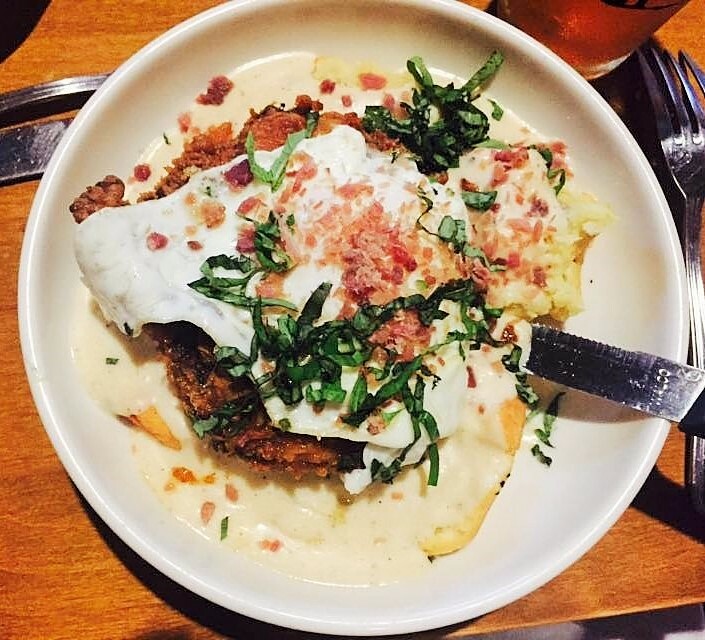 Erika had a brunch item for dinner: Fried Chicken and Biscuits! She couldn’t make up her mind what she wanted, everything looked so good, but the description of the basil gravy eventually won her over. 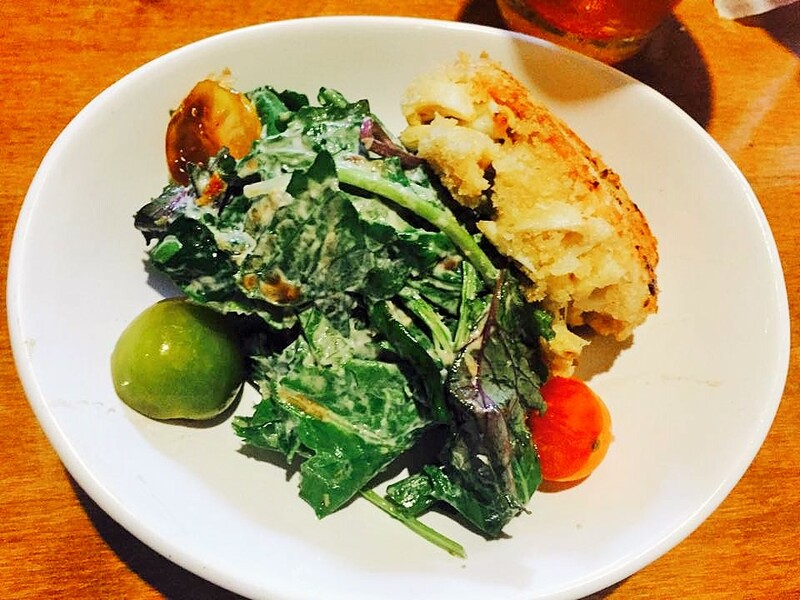 Let me set this dish up for you: Huge bowl is filled with split house made biscuits. Next, they place a perfectly fried buttermilk chicken breast patty. Add crispy NC country ham and some basil and top all of that with a fried egg. Which when Erika sank her fork in burst and gave a new level of richness to that gravy. It was decadent and wonderful, and she could barely finish a third of her meal! 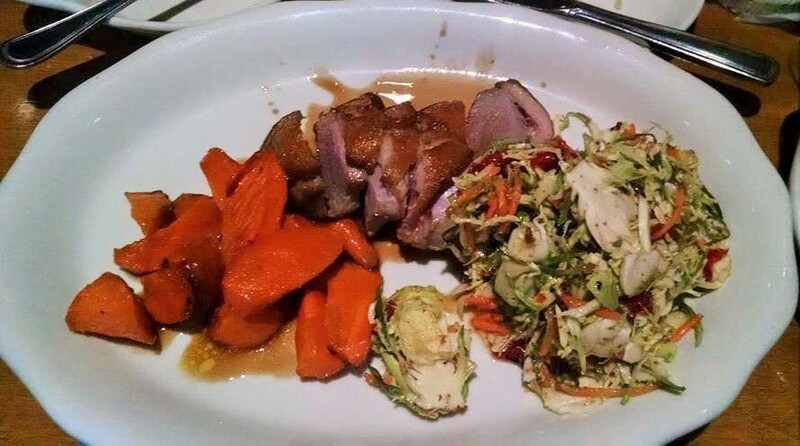 Laurie ordered Roasted Duck Breast. It was topped with a cherry port wine sauce and served with cardamom ginger roasted carrots and a shaved Brussels sprout salad dressed with a honey vinaigrette. Laurie said that the duck was cooked well, but the skin wasn’t seared enough, leaving it chewy. 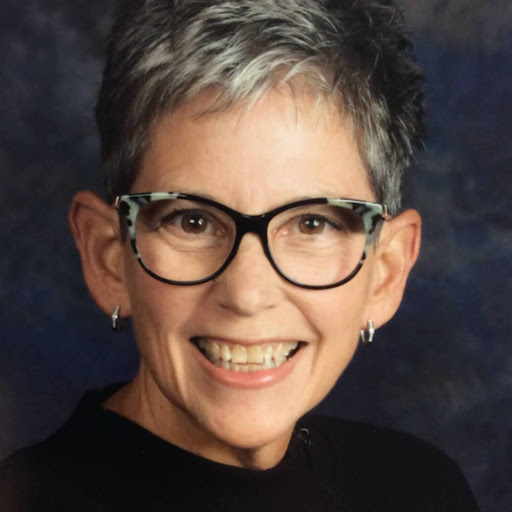 She cut all of the skin off and ate the duck breast meat. It was tasty, but she was disappointed with the skin. The salad was so tangy and creamy, much like a cole slaw. Vickie got the Jumbo Fried Shrimp. 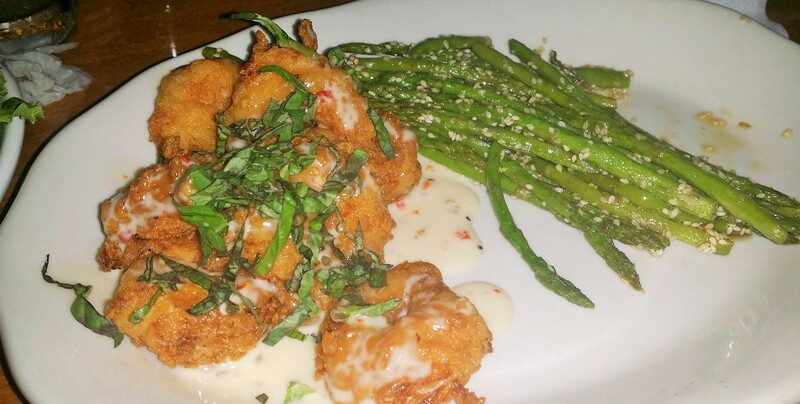 These big, juicy prawns were buttermilk fried and topped with a sticky cherry pepper lemon aioli. Vickie reported them amazing! She got hers with a side of asparagus and a side salad. I got the Hickory Nut Gap Farm Beef and Bacon Meatloaf. I’m going to be honest here: I picked something that would go with the macaroni and cheese. Because that’s what I was wanting. If you are going to cheat on your diet, you should really go all out. So, I picked fried okra, too. NO REGRETS! 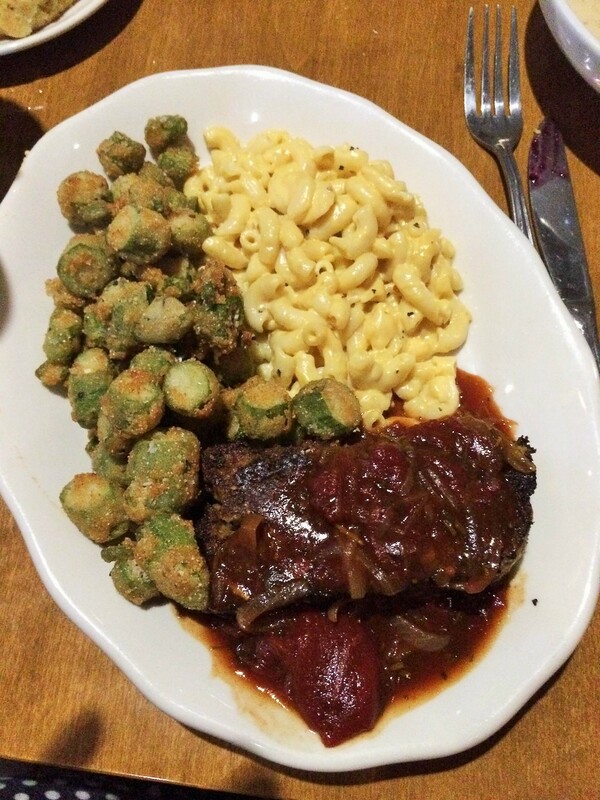 The meatloaf was so tender, and a nice brown color, unlike my gray offerings. The gravy on top was a tomato rosemary shallot gravy that was zesty and packed with flavor. I was dragging the macaroni and cheese through it, too. The macaroni and cheese was gooey and cheesy. I mean, even a bad mac and cheese tastes pretty good, but this one is yummy, no fear. 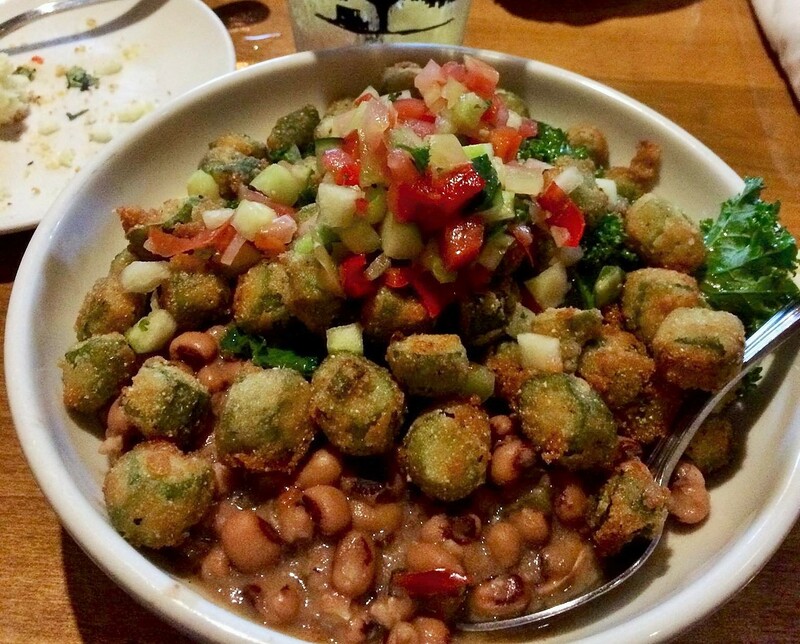 The fried okra was plump yet crispy. Not that frozen mess you get at other places. I was so happy. Joyous, really. Kathy, the healthy one in the group, opted for the Venerated Veggie Bowl. We’ll never truly know how wonderful this was because Kathy refuses to share her food! LOL I can say that it looked amazing and she couldn’t eat it all. Let me set it up for you: On the bottom of the bowl there is a layer of SC Stone Ground Goat cheese grits and that is topped with salsa verde black-eyed peas. They then pile on sauteed greens, fried okra and salsa. I love meat, but this bowl looked amazing. Lunch isn’t all that much different from dinner, but they do have more sandwiches. My favorite is probably the Shoo Mercy Cheesy Grill. 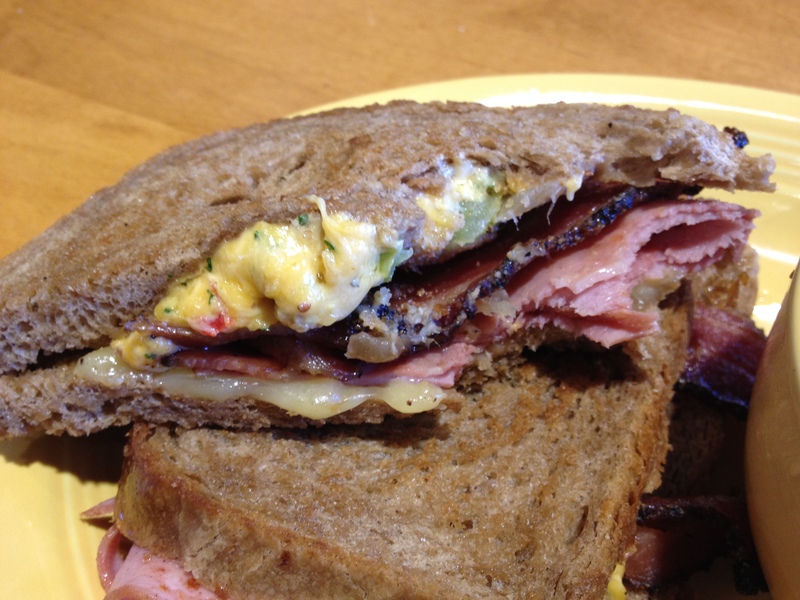 A gooey mixture of Havarti and pimento cheese tops carmelized onions, crispy maple smoked bacon, salty smoked ham, fried green tomatoes and fresh basil all on wheat sourdough bread. Sounds like a lot going on, but the combination is perfect. Squishy, salty, creamy and crispy: it hits all the notes. 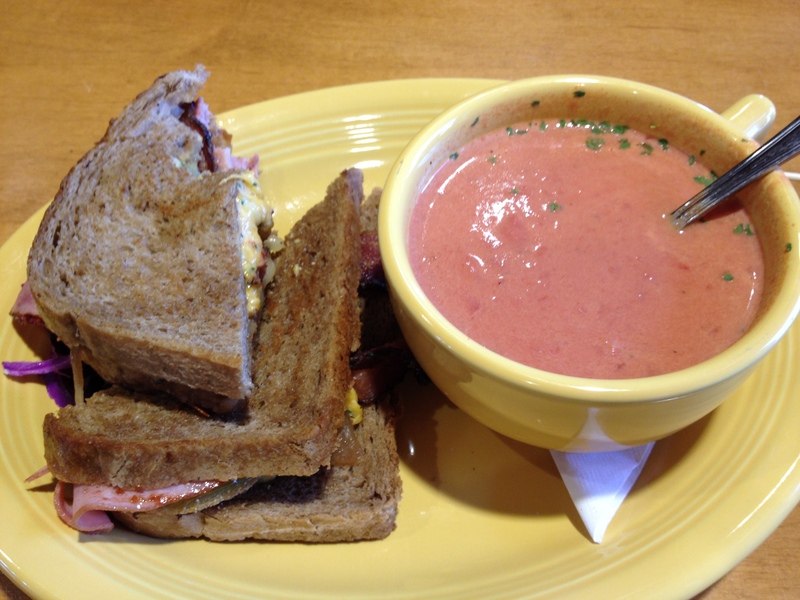 I got my sammie with a bowl of their tomato soup. Eh. A little tangy. You could make a meal on the side dishes. Seriously. Because they have a veggie plate where you can choose 3 or 4 for your meal. But, if you just want a couple with your meat (do it!) you’ll be happy too. 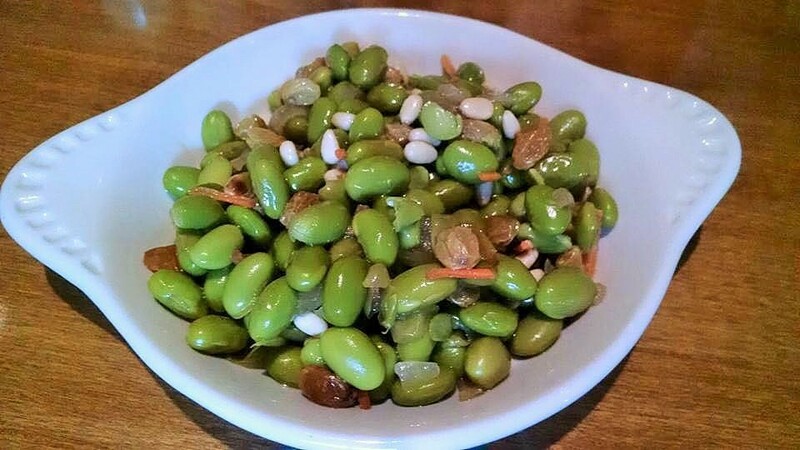 Laurie got the Edamame, Pine Nut, Golden Raisin and Carrot Salad. 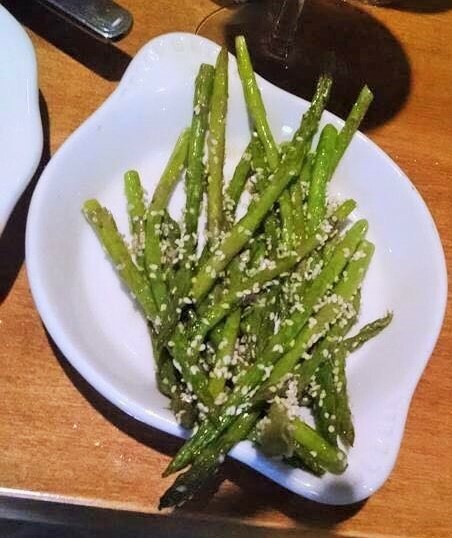 I was very suspicious of those healthy looking green beans, but I was pleasantly surprised at the sweet and tangy dressing, and the bite from the pine nuts. Healthy never tasted so good. Another favorite of our table was the Benne Coated Asparagus. Asparagus can’t go wrong as long as it isn’t over cooked. These were perfectly cooked, still had a bit of a snap, and the benne (sesame seeds, right?) added a nuttiness. Yum! 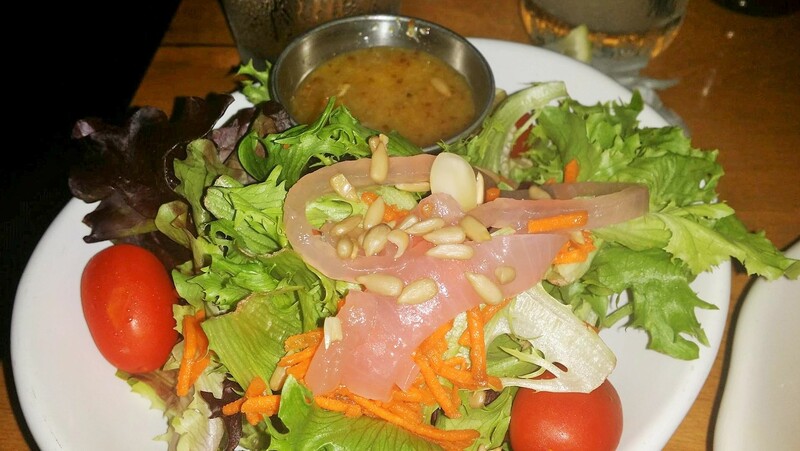 You may also choose a side salad as one of your “vegetables.” This one comes with mixed greens, grape tomatoes, shredded carrots, pickled onions and pine nuts. The pickled onions and pine nuts are tangy and crunch elements that are different from your run-of-the-mill side salad. 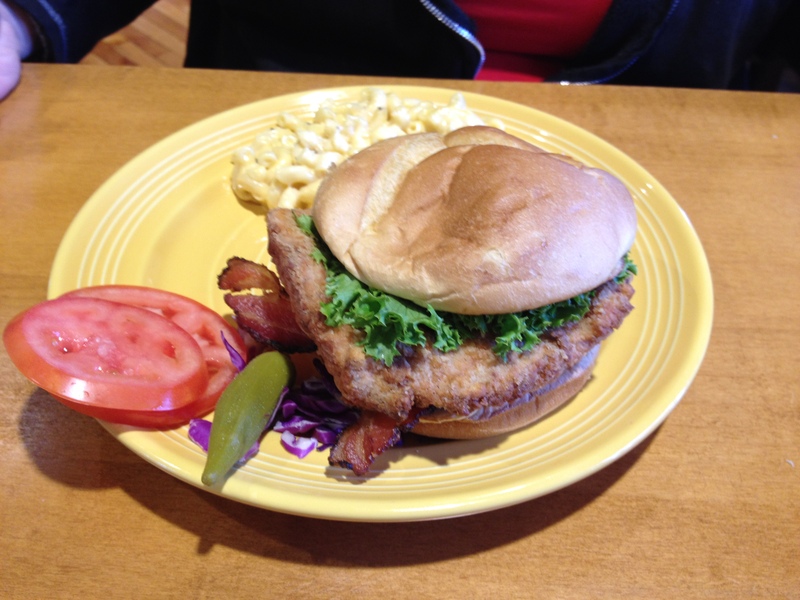 If you are looking for a delicious country meal that is a little on the upscale side, you have to give Tupelo Honey a try. Just bring a fan.